Clearing clouds provide a great view as we descend toward the village of Zinal. In September we flew to Zurich to spend a couple of weeks hiking and eating our way through Europe. We planned to spend roughly a week on the Haute Route, then spend a second week on northern Italy. 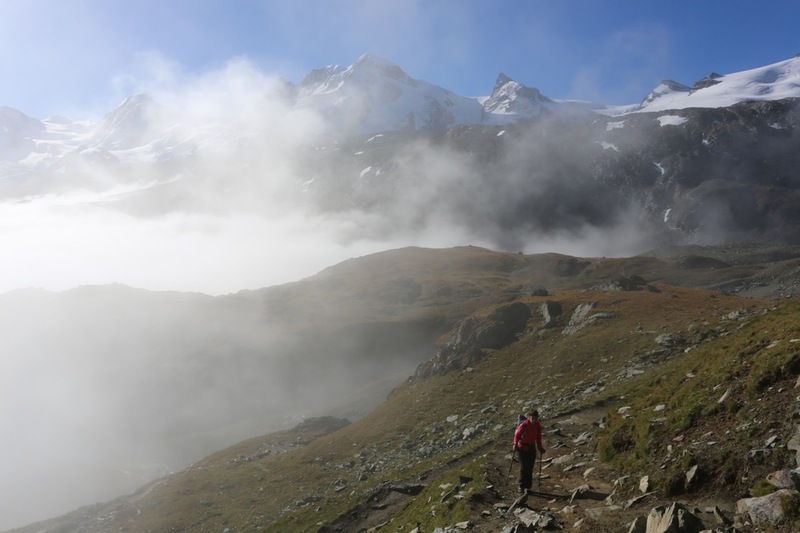 With only a week to hike, we decided to pick the best section of the Haute Route that runs from Chamonix to Zermatt. We decided to join the route at about its midpoint in the Swiss village of Le Hauderes, then hike to Zermatt. From Zurich we took a couple of trains to Zermatt, spent one night in town and dropped some gear at a hotel. The following morning we took two trains and a bus, and by about noon we were in the quaint little village of Le Hauderes. Europe is literally filled with hiking trails, mountain huts and little towns that are ready to host hikers and climbers. It is quite easy to hike from town to town, always sleeping in a bed, and eating most meals in delightful little restaurants or huts. We came prepared to camp and cook our own meals, but we soon abandoned that plan and gave in to the rhythm of European hiking. The mountains are big, the food is good, the valleys are deep and the climbs are steep. Here are some photos that capture some of our trip. Karen climbs out of the pleasant village of Le Hauderes. Dinner with fellow hikers on our first night at the Hotel de La Sage. Roast duck, salmon tartar, caramel cheesecake, wine. We suggest you stay here if you have a chance. Wildflowers and an old shepherd's hut on the hike up to Col de Tsate. As we approached the Moiry glacier, we had to hike along the sharp ridge of this lateral moraine as the weather closed in. The Cabane de Moiry, perched above a spectacular 1000 foot icefall. 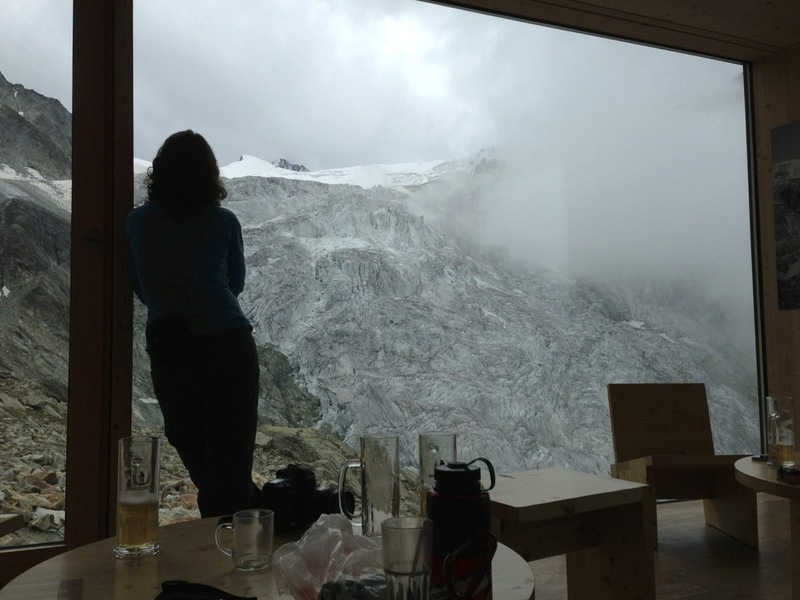 A fellow hiker looks out at the Moiry Icefall from the glass walled dining room of the Cabane de Moiry. The Moiry icefall and glacier, taken as we hiked out the next morning. An adequate view for lunch. The Weisshorn peaks through the clouds. On our 4th day, we came across the famous Hotel Weisshorn, where we stopped for lunch before a cold hike over the Meidpass in down into the German speaking town of Gruben. Karen approaching the summit of the Meidpass. The last few days of our hike saw hints of winter arrive in the Alps. The high passes were cold, windy, and sometimes covered with early season snow. Descending from the Meidpass into Gruben was a long, steep drop. A view of the Pennine Alps to our north. Our final pass was hit with early snow the night before we hiked over its summit. Here Karen ascends near the top of the Augstbordpass. On top of the Augstbordpass it was crazy cold for mid-September. Our final day of hiking was an easy walk up the valley, passing through 5 to 6 villages on the way to Zermatt. Our first view of the Matterhorn as we look down into Zermatt. Karen looks up at the Matterhorn as it emerges from thin mist. The Hornli Hut is not visible in this photo. The hut on the right skyline is passed on way up to Hornli Hut. We had one extra day while in Zermatt recently, and we knew in a flash that the thing to do would be to hike to Hornli Hut. The hut lies part way up the Matterhorn, and serves as the base for the mountain's most popular climbs. The hut is perched on a shoulder on the north ridge of the Matterhorn, also known as the Hornli Ridge. From the top of the lift a two hour hike will take you up the steep north face and across beautiful ridges, ending on a shoulder with mountain views and alpine history unmatched anywhere. 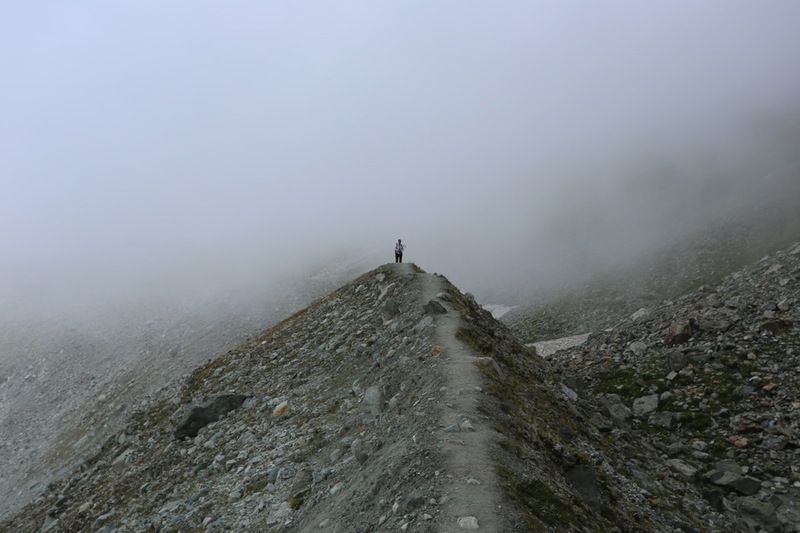 Make no mistake, it can be an exciting hike, and is not one to take lightly. We awoke to fog and mist, with no view of the mountains from town. Somewhat bummed that it would be another cloudy day, we walked over to the ski lifts at the upper end of Zermatt. Two lifts took us up to the Schwarzee hut, where the hike begins. Like everything in Switzerland, the lifts are expensive. In 2013, the ride up to Schwarzee was 49 Swiss Francs per person (about 55 US dollars at the time of our trip). Mist swirled around us as we rode the upper lift. Nearing the top of the station, we suddenly emerged above the clouds, to bright blue skies, white snow and jagged peaks. All morning the mists would rise and fall, sometimes engulfing us, and sometimes partially cloaking us in wispy, floating clouds of vapor. Karen rides the gondola from town up into the clouds. At Schwarzee Hut, we rose above the clouds. The Monte Rosa massif dominates the east side of the upper valley. Low on the hike, the trail passes through some steep and loose rock, including this short section with a built in platform. 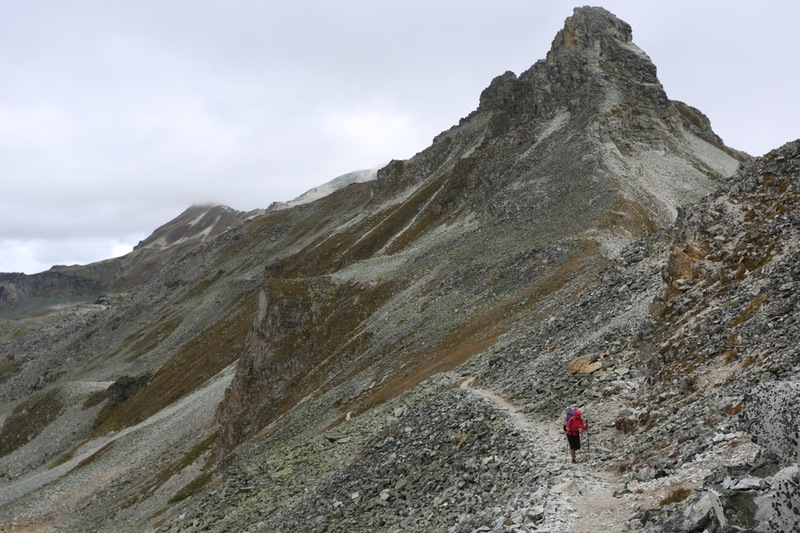 The hike starts out easily, then avoids switchbacks and attacks the mountain directly, as is typical of Swiss trails. The mountain is surprisingly steep, and much of the walk climbs the shady north face. This normally wouldn't be an issue, but our hike in mid-September followed a couple of small early season storms, and even the lower mountain had a thin layer of new snow and ice. After about an hour of hiking, the route flattens out and crosses a ridge, then again climbs rapidly up the cold and shady north face. The trail is carved into the hillside here, and in a few places a slip would be fatal, or at least extremely unhealthy. Numerous fixed cables are in place and most are well positioned to help protect the icy and coldest parts of the trail. But there are a few unprotected sections that were icy and required extreme care. We opted to scramble up the ridge at the worst part to avoid a particularly icy and exposed section. Climbers who were descending that morning were all wearing crampons, while we went carefully upward in our running shoes. As we neared the hut, the trail wrapped around the east face, and became warmer, less icy and less exposed. The risk fell away and we were free to fully enjoy the view of the Breithorn and other nearby peaks we couldn't identify. If you are climbers like we are, your hike up will be also filled with a certain amount of wonder at all the alpine history that surrounds these peaks like an invisible parchment, visible only to the few. As much as any mountain on earth, the Matterhorn is the home of alpine climbing. Don traverses the low angle ridge before the final climb up to Hornli Hut. The hut can be seen on the shoulder of the Hornli Ridge, about a third of the way up the peak. Don climbs up one of the many icy sections of the trail. 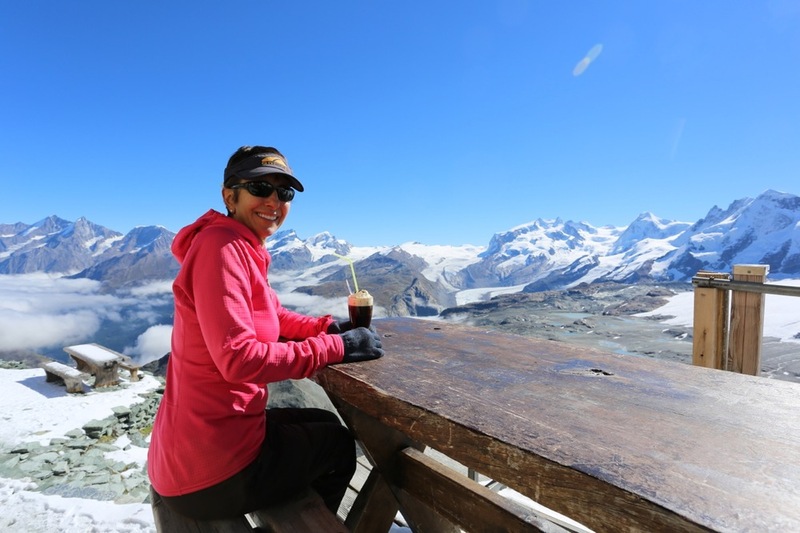 Karen enjoys a warm brandy on the outdoor platform at Hornli Hut. The clouds were dissipating as we descended back towards Zermatt.